Kell Brook: Golovkin is renowned for his ability to hit and hurt with either hand, so Brook must utilize enough movement to keep the Kazakh from getting set and delivering his punches with maximum power. Obviously the last thing Brook wants is to provide Golovkin with a stationary target, but at the same time he must be careful not to allow his movement to become excessive or too negative. In other words, enough movement to offset Golovkin, but not too much where he will be out of range and unable to lead or counter. Besides, if all you do is back pedal and invite “GGG” onto you, he will hunt you down and punish you; it’s what he does best. Furthermore, Golovkin is deceptively fast at closing distance, and by giving him his desired momentum, opponents end up having to think and work faster than they want to. As a result, they rapidly exhaust themselves, both physically and mentally. If you don’t get Golovkin’s respect, he will hunt you down. Brook must gain Golovkin’s respect early by beating him to the punch. While “Special K’s” power might be slightly overrated at welterweight, his blows are well-timed, sharp and accurate. In order to give Golovkin pause and make him think twice about coming forward with impunity, the challenger should try to set traps by taking sneaky half-steps back and then catching “GGG” unprepared when advancing with stiff jabs, one-twos and right hand leads. Brook may also be able to blunt Golovkin’s momentum by targeting the bigger man’s body and chest with the jab. Golovkin sometimes carries his weight up front as he moves forward, so a fast, blinding jab or throw-away hook quickly followed by a right uppercut might be another good option, especially if Brook can time the punch to land as “GGG” is leaning in. Brook needs to try and catch GGG coming in with right hand leads. Golovkin is very dangerous on the counter coming forward, so as soon as Brook has finished punching, he must look to change his height and angle, or tie Golovkin up to safeguard against return fire. For instance, when finishing on his right hand, Brook should duck and weave to his right to avoid a probable left hook counter. Golovkin’s overhand right thrown over the jab is another counter Brook should be wary of, particularly when moving to his left. By the same token, should Brook find himself trapped against the ropes or in a corner—the absolute worst places to be with Golovkin—he must clinch or pivot out. Simply covering up is not an option, not when you’re facing arguably the game’s most devastating combination puncher. Throwing one punch to set the table for the next, Golovkin interchanges straights, hooks and uppercuts with sublime creativity, and very few are on his level when it comes to mixing up the power, speed and rhythm of combinations in order to create and exploit openings in the opponent’s defense. 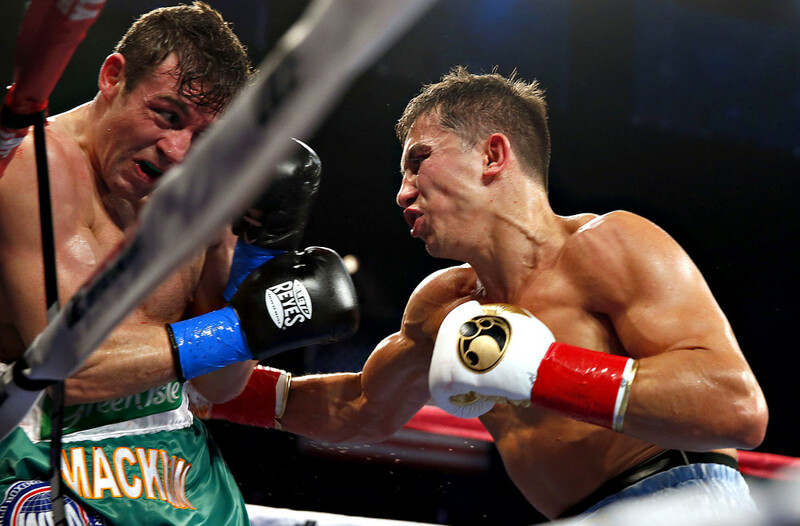 Golovkin mixes straights, hooks and uppercuts with devastating results. 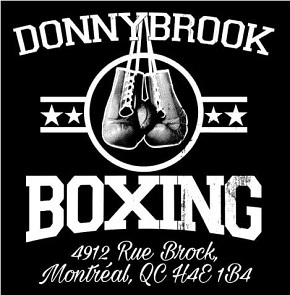 Under no circumstances whatsoever can Brook afford to stand and trade blows with Golovkin. 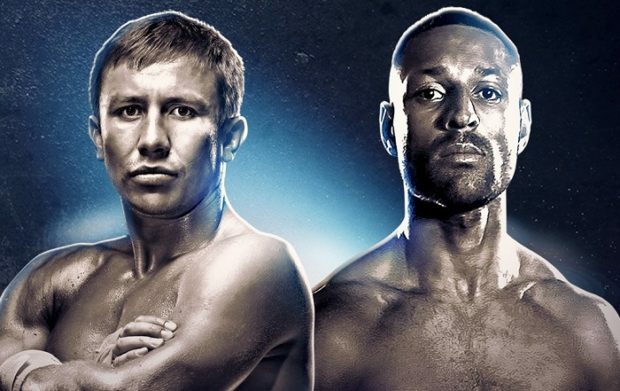 Brook is a decent puncher at 147 pounds, and he has a respectable chin, but Golovkin might be one of the biggest punchers ever at 160, and has proven that he can withstand the best from big, strong, hard-punching middleweights, let alone welterweights. On top of that, Golovkin’s raised elbow, palm-down hooks, which loop in undetected from an irregular angle and can be thrown from a greater distance than regular hooks, also have built-in defense, making Golovkin less hittable during exchanges than is generally perceived. 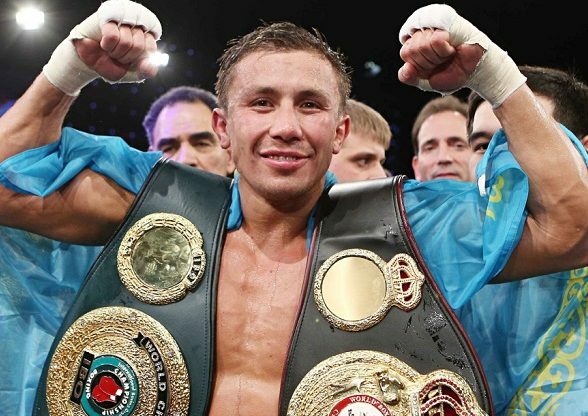 Gennady Golovkin: The champion’s gameplan should be relatively straightforward. He will want to corral Brook into the ropes and corners by cutting off the ring, and then work him up and down with combinations. If Brook tries to circle out to his right, Golovkin will want to step diagonally forward and to his left, then keep him contained with a left hook, ideally thrown to the body. 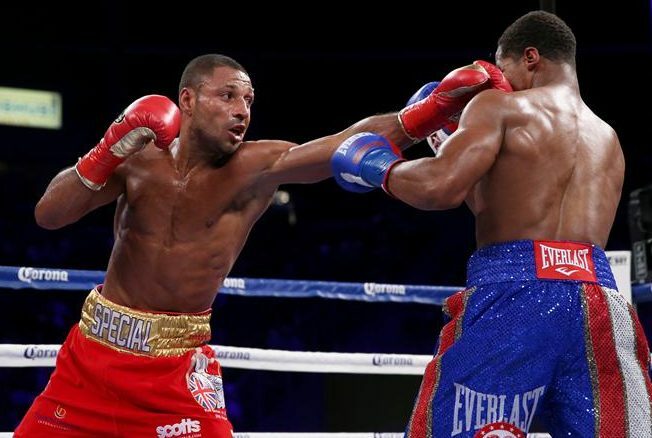 Likewise, should Brook redirect his movement and try circling the other way, a diagonal forward step to the right followed by a right hook will accomplish the same purpose. 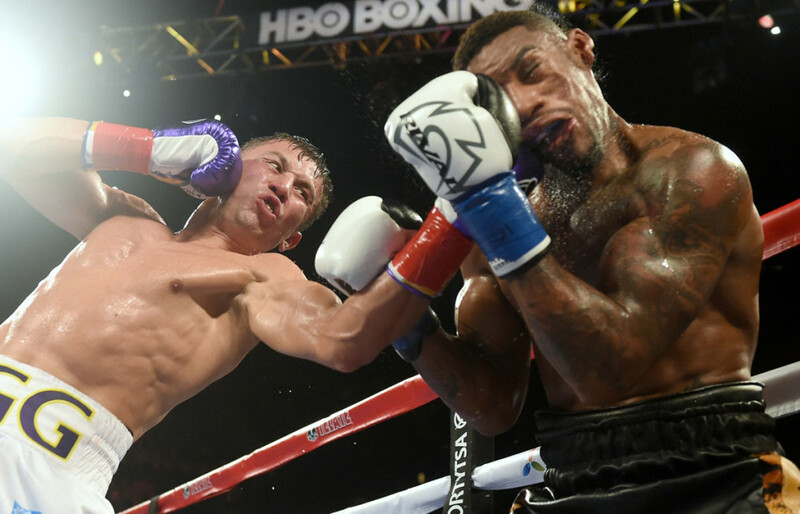 Make no mistake, Golovkin’s footwork might not look as pretty as that of boxing’s more fleet-footed movers, but you can’t argue with results. It serves his needs, and easily ranks among the most effective in the sport. The Brook jab could be a key weapon in the match. I don’t expect Brook to be on his bike as much as some anticipate, but body punching will be needed to curb his movement nonetheless. In addition, Brook is very good at slipping and riding punches, so it’s important that Golovkin, a tremendous body-puncher, doesn’t head-hunt searching for the knockout. 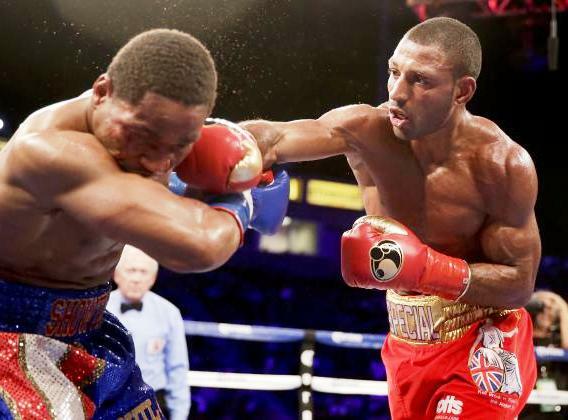 Brook enjoyed some success against the ultra-aggressive Shawn Porter when turning the corner off of the check hook, but unlike Porter, who charged and lunged forward recklessly, Golovkin’s pressure will be more educated. He will feint, jab, slip and counter his way forward, and while doing so I doubt he’ll overcommit and throw himself off balance. Sturdy, functional and non-telegraphic, Brook has one of the best jabs in the welterweight division, maybe the best. He also shrewdly takes advantage when his jab is slipped by forcing his already extended left arm against the side of an opponent’s neck, which allows him to step over to his right and land a right cross unobstructed. Meanwhile, Golovkin has one of the most authoritative jabs in all of boxing. 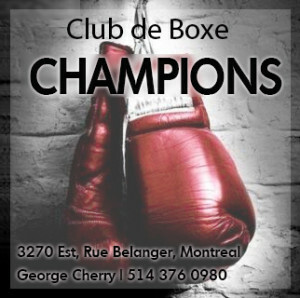 As well as using it to inflict damage and control range, as he did throughout his fight with David Lemieux, “GGG” often combines his jab with a rear hand parry or outside slip, enabling him to both evade and counter his opponent’s jab simultaneously. Because Brook will be trying to stop Golovkin from getting into a rhythm, possibly by clinching after throwing the one-two or with head control via the aforementioned jab, Golovkin’s own rhythm-breaking jab, timed to intercept and disrupt Brook’s attack, must be established. 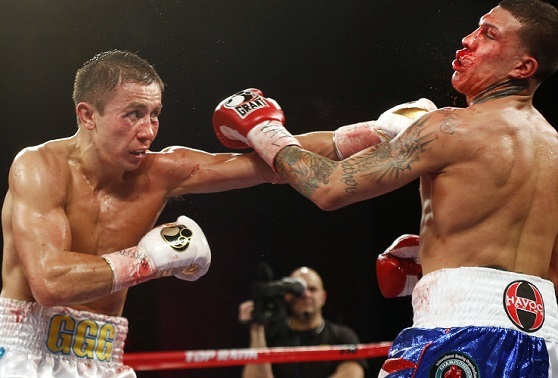 Golovkin’s jab is just as dangerous. Conclusion: I hope I’m proven wrong, but I foresee Golovkin vs Brook being a physical mismatch similar to Canelo vs Khan. In fact, things might be even more ominous for the smaller man stepping up in this bout. Think about it: Brook and Golovkin will probably engage more than Khan and Canelo did because Brook, who isn’t as mobile as Khan and is probably even less so now due to the extra weight he’s carrying, tends to rely more on upper-body movement and blocking/deflection techniques for defense than evasive footwork. At the same time, Golovkin, a natural pressure fighter, is more adept than Canelo at fighting on the front foot and confining ring space. Thus, I very much doubt Brook will be able to keep “GGG” at bay and outbox him for 12 rounds. I’ve always felt that the way to beat Golovkin, provided you have the necessary skill set and physical attributes, is by holding your ground, taking away his leverage and power by smothering him, and countering off of your defense. 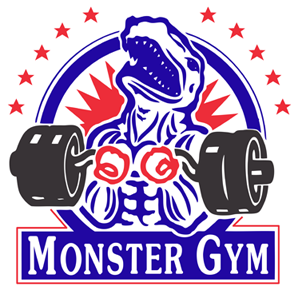 Brook has gained a lot of muscle for the fight, so maybe this is what he intends to do. Still, it remains highly unlikely that Brook will be physically strong enough to compete with Golovkin inside the pocket; muscle mass does not equate to strength in boxing (see Carlos Monzon). Unless I’m sorely mistaken, Golovkin will hold significant advantages over Brook in size, strength, punching power, and perhaps even ring craft, as it’s certainly not a given that the Englishman is the more skilled of the two. Regardless of what strategy the natural welterweight employs, a stoppage win for the fully-fledged middleweight looks inevitable. The fight may end up lasting longer than expected, however, simply because the worst-case winning scenario for the champion, at least in my opinion, would be an early knockout. Therefore, should Golovkin determine that Brook isn’t much of a threat physically, he may take his time before administering the knockout dose. Great work as always, Lee. I have lost so many time to find a guy that has so much knowledge to share. Thank you so much. Good read, Lee. I am wondering what boxers from 160 and up have the strength and skills to smother GGG in bout? Canelo has the counter-punching skills, but I think GGG would be too much. Anyone at 168? I mean the biggest fight for him would be against Ward, who has the size advantage but he’s slip and move kind of fighter that can get clipped by GGG’s patience to land a shot. I’ve always been thinking of a gameplan to beat GGG. People think a speedster going in and out with lateral movement could trouble GGG. I don’t buy it. He will tire you out by cutting the ring off, break you down with body shots, and probably clip you with a sweeping hook. I got it as you have it Lee. we shall see. Regardless, I am still “taking my hat off” to Kell for taking this particular challenge….huge RESPECT to him. GGG, well he is just the man, nuff said.